Thursday morning we woke up FAR too early, and headed over to the airport (about a 5 minute walk) to get our flight to Istanbul. It was a pretty good flight, I got the window seat, and it was a beautiful clear day flying. We’re pretty sure we flew over the Alps – there were definitely mountain ranges with snow on them, and then flying in to Istanbul was amazing too – it’s so spread out! No hassles getting our luggage, and we found the hire car desk to get our car. We got up to the car park and found the car we’d booked was kinda dirty, and a much bigger alternative. Pete decided to go for the bigger (cleaner! ), one and we packed our stuff in and headed out. I was in charge of navigation, and got given a bit of paper with the instructions on how to get to our accommodation printed on it. We also had a GPS set to the hotel, and the car GPS on as well. The car GPS got turned off pretty quickly, and we followed both the instructions and the GPS onto the motorway. Once we got out of the city it was a really interesting drive! Lots of buildings with whole apartments front walls collapsed, but looking like people were still living in the other apartments around them. I took a bit of video, put on some music (Sister Hazel’s ‘Heartland Highway’), which kind of worked, and took lots of photos. We stopped at a petrol station to get some water and something to eat, but just left with water, and got back on the road. After a couple of hours driving the GPS wanted us to go one way but the bit of paper seemed to want to go another, so Pete took the GPS route, and we ended up driving through about 3 small towns, dogs laying in the middle of the road, men sitting drinking coffee on the side, and a statue (presumably of Kemal Ataturk) in the centre of each. This wasn’t nearly as scary as the bits between the villages, with shepherds and dogs that wanted to chase our tires! There was only a small amount of screaming from me though! We think the GPS cut off a small corner of road because we ended up back where the directions wanted us to be (to my relief!). I’m not sure if I’m misrembering – Turkey seemed green, but a different shade of green to New Zealand. We got in to the hotel about 7ish, checked in, and went to our (seriously amazing!) rooms. Dinner was offered and the Lonely Planet website had suggested sticking around for it, so we did – it was NOT a mistake! We arrived at the dining room a bit after 7.30 and chatted with a beer (Efes), and some other guests, all British, who had spent the day exploring Gallipoli. I can’t remember how much dinner was, but I know it was worth it, 5 delicious courses, vegetarian not a problem (although I know we did let them know that in advance). After dinner, we headed off to bed as we were planning to get up stupidly early again. Friday morning we got up about 5.30am, dressed warmly, and drove down to ANZAC cove for dawn. We almost made it, it was just starting to get light as we drove down, but it definitely wasn’t fully light when we got down there and found somewhere to sit. I don’t even know if it’s possible to describe what it’s like there, I know it’s changed quite a bit in the last 90 years, but it was incredibly peaceful sitting there, watching the sky get lighter and waves lightly crashing on the beach. Hard to imagine what it would have been like landing there in 1915. I’m not sure how long we sat there, but when the sun was visible (behind the Sphinx) we walked around to the end of the beach and back then had a brief look at Ari Burnu cemetery. 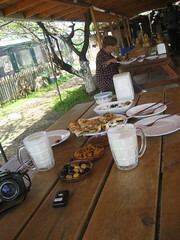 I found someone who could be related to me and drove back to the Gallipoli Houses for breakfast (more deliciousness!). 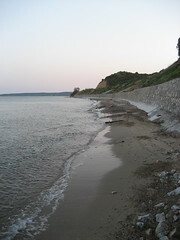 After breakfast, I drove back down toward ANZAC cove, parked, and took a walk along the road. I came across the famous quote from Ataturk and stopped to have a look. I know that I’ve read it before and it touched me, but seeing it there really drove it home, and I was really close to tears reading it again. We made our way back to the car, and drove around the peninsular a bit more, past a crew setting up tiered seating, presumably for ANZAC day. We drove along, stopping every so often so I could take photos of the plaques/infographics. I was sad we couldn’t have a look at everything, but we really didn’t have time, so we eventually turned around and headed up towards Lone Pine and Chanuk Bair. There were a few times I pulled over suddenly, spotting things I wanted to investigate, there are definitely things I need to look up still. 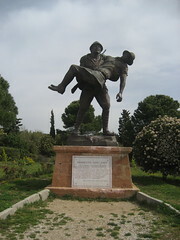 This statue was interesting, especially when Pete noted that he was carrying a British rifle on his back! We kept heading up towards Lone Pine, stopping every so often at graveyards. Probably the most moving for me were the ones where there are hundreds of bodies buried, with hardly any identified. The Nek was one of these with 10 identified burials and 316 unidentified. I really don’t have any words to describe how that felt/feels. At Lone Pine we had a proper look around, there were people there setting up more tiered seating for Anzac Day. We had a bit of a look through the cemetery then found a path going down towards the ocean so had a look down there. Pete managed to find some trenches so I went to have an explore down them, found a turtle on the way, and took a video walking through the trenches. They weren’t hugely deep, but there was a definite shape going through. You can also see they’re put some logs and barbed wire up. I wandered back up and had a look at the cemetery and memorial. There were so many names, and I found it hard to imagine so many people dying/being injured at such a peaceful spot. As we had been driving up the road I kept spotting an interestingly shaped memorial and wondering what it was, and we eventually got up to it. 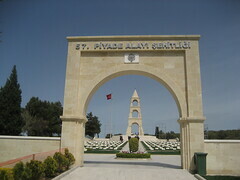 It turned out to be a memorial for the 57th Infantry Regiment (under Ataturk), and unfortunately (at least for me! ), a bus full of Muslim people pulled up in front of us, so I felt compelled to put my sweatshirt on. I’d taken it off in the nice warm sun, and until then it had felt like we were the only people for miles so I wasn’t too worried about offending anyone. This memorial had really interesting statues inside, all with plaques in Turkish, so I have no idea what they were about (further research needed obviously!). Probably my favourite was of a little girl and a man. This one was also filled with beautiful red and white tulips. Interestingly there was what I’m fairly certain was a prayer area with shelves of blankets and a partition going half way across. We finally hit Chanuk Bair, the major New Zealand memorial/cemetery. This one, like the 57th Infantry Regiment had people set up selling things, but having just had an ice cream (mostly to get some change to use the loo), we didn’t stop, strolling up towards the two imposing looking memorials on the top of the hill. For some reason every time I come to finish this blog entry off, I get stuck here. I’ve just spent an hour or so putting all the pictures in (I was writing this as a word document). I guess there’s something that defies description about it. I know I spent a while looking around, mostly on my own, or at least separate from Skyring (in the same way that we were sitting next to each other, but completely separate watching the sun rise that morning). And I know there was another cemetery with hundreds of unidentified soldiers buried there. It really plucked at my heart. After Chanuk Bair, we were getting hungry, and a bit tired, so we drove all the way back down towards the Gallipoli Houses, stopping at a lunch establishment that had been recommended to us on the way for pancaky things. We ordered FAR too much food, and it was slightly doubtful if it was going to be vegetarian or not (I wasn’t going to stress *too* much if it wasn’t, I did my best to order, but sometimes it’s easier to just eat). The milky drinks were interesting, we were both kind of expecting something like a lassi, but it was much more like greek yogurt and milk mixed together. After completely stuffing ourselves (and still leaving food behind!) we headed back to the GH for a nap before yet another delicious dinner. Next morning we got up much later than the previous two mornings, had breakfast, and packed the car ready to drive back to Istanbul. I drove until lunch (more lentil soup, which was delicious, but not as good as the first time I had it! ), and then Skyring took over on the exciting highway bit. As far as I can tell, everyone in Turkey drives like maniacs, at one point we ended up in the emergency vehicle lane, simply because there were SO many other people in it, we thought it was the lane for the exit we wanted to be on (well we did get off on the right exit, so that’s something!)! We managed to get the car dropped off at the airport fine, and then got a taxi to the next hotel, which seemed to take an age, but with a superb taxi driver (according to Skyring anyway, who I’m willing to concede has more taxi experience than me!) who insisted on taking us the quickest route, even if we’d pulled off, if there was traffic on that road, we’d somehow end up back on the motorway again! I got a few good pics of beautiful tulips, as well as the Walls of Constantine. Found the hotel, dumped our luggage, I got changed into something slightly more appropriate (yay blouses! ), and we headed back out onto the mean streets of Istanbul. We first headed over to the Basilica Cistern, to see if it was still open, but sadly not, we’d just missed it, so we had a quick look around the outside of Hagia Sofia and the Blue Mosque, and headed towards the hostel part of town to find somewhere to eat. Token food photo for Dad! We ended up at a fish restaurant (of all things!) on the roof of a hotel. Skyring had fish (of all things! 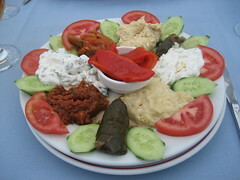 ), and I had a delicious meze (the dolmas were particularly delicious!). It was a pretty nice evening, although I wished I had brought a jersey. The restaurant had great views over Istanbul, and especially over the next door neighbours who were barbequing on the roof of their building! Baklava and apple tea for desert, which was a-mazing! Probably the best I’ve ever had (the baklava anyway, not that there was anything wrong with the tea!)! The next morning we were up bright and early, and had breakfast on the terrace of the hotel overlooking some more of Istanbul. After breakfast we headed back along to the Basilica Cistern, which I’d heard about in Turn Right at Istanbul by Tony Wright, and had wanted to visit ever since. They were as magical as I was expecting, full of this amazing yellowish/red light, water, fish, and eery music. This was my favourite thing in Istanbul. After having a good look around (the Medusa heads were fascinating! ), we headed back out, I bought a pile of postcards, and we walked to the Hagia Sofia. We lined up for tickets, and it didn’t take long for us to get them. First stop for me was the loo, and then we headed inside. Hagia Sofia was busy, but still extremely magnificent. I am still awe struck by the fact that these buildings are still standing, even though some of them have been there for more than 1400 years! (And yes, the geek in me is thinking, that’s longer than the Doctor has been alive!). We had an explore, marvelling at the mosaics, then rambled through the Topkapi gardens, headed towards the Grand Bazaar to look at carpets, stopping to have lunch on the Golden Horn (at yet another fish restaurant, with yet more lentil soup (I’m a big fan! ), where the waiters really liked Rangimarie and Ring/routebeer. I also had hot chestnuts for the first time (verdict = delicious)!. 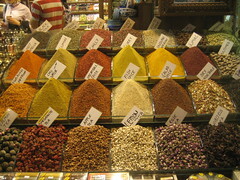 After lunch we kept going towards to the Grand Bazaar, through the Spice Market, which was gorgeous! Skyring insisted he knew where he was going, and we did eventually find our way to the Grand Bazaar, only to find that it is closed on a Sunday, so we didn’t even get to have a look through! We decided to head back to the hotel to get to the airport, and only stopped to go loo again, and to buy some halva, which I’ve been wondering about for ages, but haven’t ever got because I love baklava so (verdict = delicious :p). More nondescript flights, we picked up Skyring’s camera he’d left in the rental car, I bought some turkish delight and baklava at the airport, and we got back to my flat about midnight, where we fell into bed! Very interesting reading. 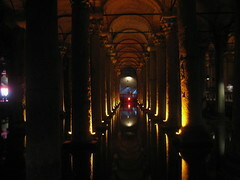 The Basilica Cistern sounds worth a visit. It really is! You should definitely check it out if you’re ever in Istanbul.